GEO ExPro - Texas sized mystery solved? Scientists at NASA are reporting that they have a solution to the mysterious red colouration observed at the polar regions of Pluto’s moon Charon. And the cause could be something very close to our hearts, hydrocarbons. According to co-investigators on the New Horizons program, Charon’s polar colouring comes from Pluto itself - as methane gas escapes from Pluto’s atmosphere it becomes “trapped” by the moon’s gravity and freezes to the cold, icy surface at Charon’s pole. This is followed by chemical processing by ultraviolet light from the sun that transforms the methane into heavier hydrocarbons and eventually into reddish organic materials called tholins. NASA's New Horizons spacecraft captured this high-resolution, enhanced color view of Pluto’s largest moon, Charon, just before closest approach on July 14, 2015. The image combines blue, red and infrared images taken by the spacecraft's Ralph/Multispectral Visual Imaging Camera (MVIC); the colors are processed to best highlight the variation of surface properties across Charon. 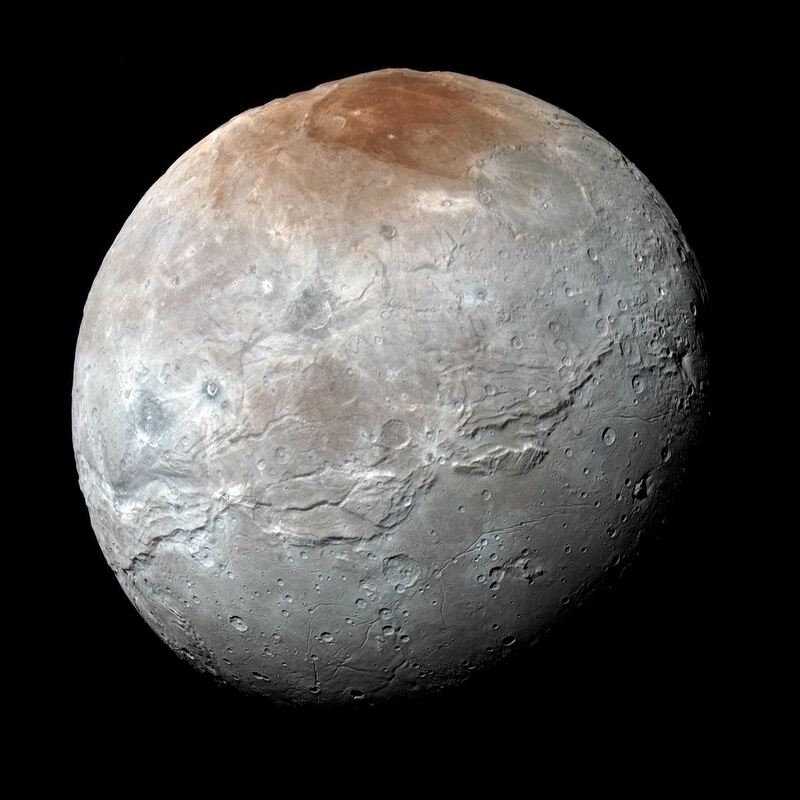 Scientists have learned that reddish material in the north (top) polar region – informally named Mordor Macula – is chemically processed methane that escaped from Pluto’s atmosphere onto Charon. Charon is 754 miles (1,214 kilometers) across; this image resolves details as small as 1.8 miles (2.9 kilometers). The New Horizons team combined analyses from detailed Charon images with computer models of how ice evolves on Charon’s poles and determined that conditions on the Texas-sized moon were cold enough to freeze methane gas into a solid - Charon’s 248-year orbit around the sun creates some extreme weather at the poles, where 100 years of continuous sunlight alternates with another century of continuous darkness and surface temperatures can dip to -430°F/-257°C. “The methane molecules bounce around on Charon's surface until they either escape back into space or land on the cold pole, where they freeze solid, forming a thin coating of methane ice that lasts until sunlight comes back in the spring,” said Will Grundy, New Horizons co-investigator, Lowell Observatory, Flagstaff, Arizona. But while the methane ice quickly sublimates away, the heavier hydrocarbons created from it remain on the surface. Sunlight further irradiates those leftovers into reddish tholins that have slowly accumulated on Charon’s poles over millions of years. New Horizons’ observations of Charon’s other pole, currently in winter darkness – and seen by New Horizons only by light reflecting from Pluto, or “Pluto-shine” – confirmed that the same activity was occurring at both poles. You can find out more about the New Horizons mission by following the links below. If you are interested in finding out more about other natural methane occurrences, a bit closer to home - let's face it despite the best efforts of Elon Musk and SpaceX, a trip to Pluto is not a realistic probability in the near future - you could do no worse than reading our excellent Collection of articles on gas hydrates - Link.